The Co-operative has become the latest bank to introduce contactless payments on credit and debit cards. 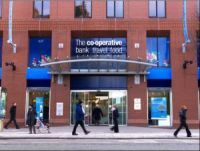 Co-operative Bank customers will be able to make purchases of up to £20 without entering a PIN number or putting their card into a payment terminal. The Co-op is planning to issue contactless payment cards to more than two million debit and credit card customers, giving them to all new customers and replacing people’s existing cards when they expire. When the user holds a card over contactless-enabled Chip and PIN terminals, transactions are automatically added to a credit card bill or debited from a current account. The Co-operative Group has installed terminals in 172 of its food stores within the M25, four in Manchester and right across its network of pharmacies. Contactless debit and credit cards were first introduced in 2007 and there are now around 15m contactless cards in circulation in the UK. HSBC and NatWest are among the providers that are currently replacing existing cards with contactless cards. Barclaycard unveiled a slightly different take on the contactless card with the launch of the PayTag in April 2012. This is a mini stick-on credit card, designed to be attached to a mobile phone and used at contactless terminals in the same way as contactless cards. Recent research suggests that people are still reluctant to embrace contactless cards though. Mintel found that only 25% of contactless card holders are ever using them to make payments. Mintel found that although 9 million consumers know they have a contactless card, 3.8 million are not sure, while the majority of people think they should only be issued on request.